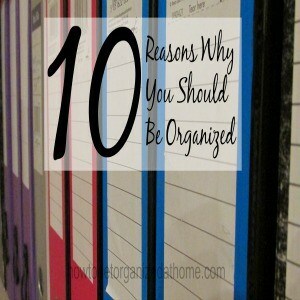 There are some great reasons why being organized can help you in your life, it can make you feel better about your home and your family, it can even give you more free time, which you can enjoy doing the things you love rather than things you don’t enjoy or really want to participate in. It is important to understand that you don’t have to make sudden changes, taking your time and making these changes slowly are more likely to last long-term. Being organized saves you money, you don’t have to buy replacements of items that you already have just because you can’t find the item, or you left it behind because you weren’t organized and ready with all the items you needed. Being organized saves, you time; how many times do you run around your home looking for items because you can’t remember where you put something and it makes you late for an appointment? If you’re organized, it will mean that you are on top of even the most unpleasant tasks; this means they are never quite as bad as if left for long periods. If you’re organized, you will have more time to do the things, which you love, your home life and working life will run smoothly giving you more time with family and friends. There is nothing worse than being late for an appointment; being organized will allow you to get out of the door on time and giving yourself adequate time to reach your destination without rushing or getting flustered. If you’re organized, the rule of thumb should follow that you are happy with how your home looks. For me, with the perfectionist streak, there are always improvements; it might just be a cushion out-of-place, or, a patch of dust I have missed. Whatever the problem the perfectionist will always spot these. However, that doesn’t mean that every person is there to get the perfect look every time be happy how their home looks and feels to them. With your home organized, it will give you the time to do the fun things with your family and this can help you and your family being healthier. You also won’t be surrounded by extra dust that can affect a person’s health. The other side to this is the potential for an organized person to go over the top with their cleaning products, natural are the best. Being organized, on time and not missing, any event or appointment can help increase the confidence you feel. Missing appointments and being late is embarrassing and is detrimental to your confidence. Being organized will remove this conflict and will help build your confidence. The more organized you are the better you will feel, you will be able to do the things that you want to do and this can give you more energy than you can imagine, positive for your health and well-being too. If you are on time, never late or miss an appointment, this can help others, too, who are struggling with these sorts of problems. You will be a positive role model, showing how much easier organization can make your life. Therefore, if you ever wondered if organization is going to help you, you might be surprised just at the positive effects it can have on you and your family’s life. Thanks for visiting Heather, I hate getting overwhelmed when things don’t go according to plan!